After work today, I decided to work in my garden. Stopping by my car to fetch my water bottle, I noticed a little olive green sparrow-sized bird sitting on the ground just a foot or so from the passenger door. Because it did not fly away as I approached, I assumed it to be injured. I slowly set my phone, glasses, garden bag down in the grass and knelt in front of the little fellow. He didn’t move. As he raised his head and looked at me, I noticed a small spot of blood on his throat and his blood stained beak. Even at the sound of my voice, he made no attempt to move. I took off my black sweatshirt, covered my hand with it and slowly reached around behind him and picked him up. He made four rapid little chirps in protest and then fell quiet. He did not struggle as I fussed about preparing a place for him. I got out the small cage that I keep around for this very purpose, a little dish of water, a chopstick and my Peterson field guide. Having set up my bird hospital on the porch, I lowered him onto the bottom of the cage on a bit of newspaper as his feet seemed too weak to hold onto the wire bottom of the cage. His little claws were so fine, they caught in the fabric of my sweatshirt. He settled on his belly and stayed very still. With the chopstick, I put a drop of water on his beak and the blood began to clear away. As I looked him over and considered his plight, I began to surmise the little guy had most likely been engaged in chasing some other bird from his nest. I set the top of the cage over him and began to search for his likeness in my Peterson Field Guide. 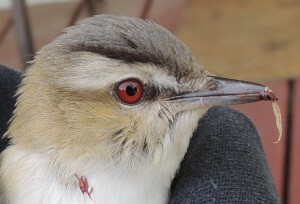 Soon enough I found him – a Red Eyed Vireo. He winters in the tropics and has a song rather like a robin’s “pretty bird” call, only blurred. As I read, I glanced at him. He closed his eyes for a couple minutes at a time and sat very still. After about 10 minutes, I began to be aware of the birds singing around me. He seemed to become aware of them also and began to look more lively, looking around with interest for the first time. Then, as if shaking himself from his stupor, he fluttered to the top of the cage and clung there upside down and let out a chirp. I have seen this happen before. 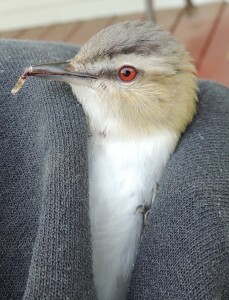 Sometimes an injured bird just needs a few moments out of harms way to recover. 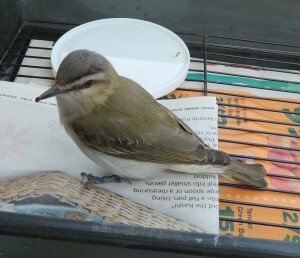 I took the top of the cage off and slowly tipped it and the vireo sideways. He looked around some more, crawled along the cage bars toward the opening. He paused a moment and left a big, uhm, “blessing” on my Peterson Field Guide and flew out of the cage and into the oak tree nearby. I smiled as he disappeared into the soft spring green cover of oak leaves in the nearby tree and retrieved my collection of things from the grass. As I walked along the path to the garden, I saw the vireo fly into the pear tree ahead of me where he sat looking at me. I am sure it was him, for I could still see the red spot of blood on his throat. He just sat there for a moment considering me and I him. Ah, the story he will have to tell at the nest tonight. Me too. This adorable little red eyed vireo is known as a fierce defender of his nest driving away even the pileated woodpecker who is about 5 times his size! This explains the blood on his beak! I didn’t realize you had this nice website/blog! It was very touching to read about the Vireo. That little vireo is an amazing, brave bird. And you are an amazing person, Joyce, out there in the world helping both people and critters alike.